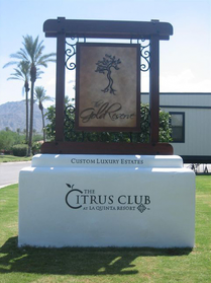 The Citrus Gold Reserve Homes are Twelve Luxury Estates that are designed and personalized by the TMC Company Incorporated at The Citrus Country Club in La Quinta. Each Estate is distinctively created with stunning timber and stone accents giving rise to an open “Santa Barbara caress. The Citrus Gold Reserve is a lavish, new concept introduced to the Citrus. Each estate boasts a 1,200 square foot basement accommodating such luxuries as a wine cellar, cigar humidor, or any storable items which would require a controlled environment. The masterfully crafted bedrooms are generously proportioned allowing designers the flexibility to create an intimate space or a simpler, more utilitarian area. The considerable bathrooms gleam with resplendent glory. Fresh marble splashes fully extend developing a finished appeal for those accustomed to a sophisticated lifestyle. The Gold Reserve Luxury Estates incorporate a minimum three car garage with a separate golf cart garage, allowing for ample space to protect the other treasures our clients might enjoy. Innovative concepts include the Casita designed for the most discerning guest. The Casita is a generous two bedroom dwelling rich with details to make even the most discriminating guest or family member cozy in abundant comfort. In addition to these great features, each Estate also includes an ample media room, a great room, indoor/outdoor fireplaces, and many other fine amenities throughout the home. If you would like to see property at The Citrus Gold Reserve or The Citrus, please call us at the numbers below. Were committed to helping you find the home of your dreams.